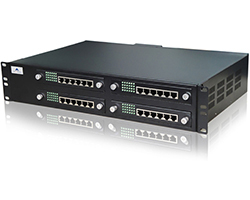 MX120 is a high capacity and high performance VoIP gateway, packaged in a 2U chassis with up to 96 FXS and FXO ports. MX120 is ideal to be deployed by ITSP as gateways to deliver IP-Centrex service in enterprise and residential applications. With dozens of port configuration to choose, it is also ideal to be used in enterprise IP-PBX solutions.